Join us for a Mayoral, musical, Italian job – for charity! 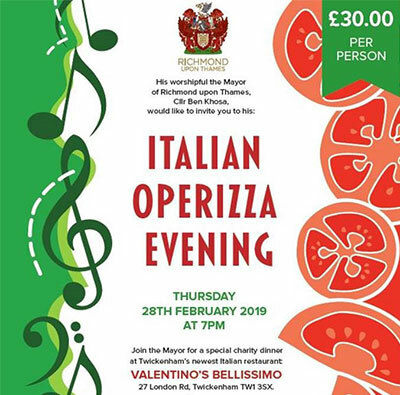 Enjoy pizza, pasta and prosecco – whilst enjoying an operatic performance at the Mayor of Richmond’s charity Operizza evening next month. Hosted by the Mayor of Richmond upon Thames, Twickenham’s newest Italian restaurant, Valentino’s Belissima, will be holding the special celebration meal to raise money for this year’s Mayoral charity – Refuge. The evening begins at 7pm with a glass of prosecco when guests arrive. This is followed by a three-course special menu. Between courses, guests will be entertained by Clarinda Chan, a semi-professional opera singer from Twickenham. Tickets cost £30 per person and includes the prosecco and meal. A cash-bar is also available throughout the evening and a raffle. 'This will be a fantastic evening. You will not only enjoy a mouth-watering three course Italian meal with friends and family and a performance from the very talented Clarinda Chan – performing a repertoire of operatic classics, but it'll also give you the chance to win a selection of amazing prizes in a raffle... all while supporting Refuge.